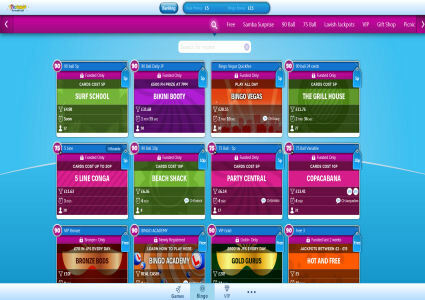 Rio Bingo is the latest site launched by the Mandalay Media company, the same people behind brands including Costa Bingo, Fancy Bingo and Sing Bingo to name but a few. This new standalone site opened their virtual doors on Thursday 24th April and in our humble opinion the place looks fantastic with a colourful Rio inspired background accompanied by an array of cheeky macaws, all building up the excitement levels before you have even had chance to sign up! The registration procedure is nice and simple and if you have played at any of the other 888/Globalcom powered sites before, you will be familiar with the process. You will need to come up with a username and an email address but don’t worry as they are not associated with a network, you won’t come across any of those annoying ‘duplicate account’ problems. They are offering a small amount of free money without you having to make a deposit, but you will need to enter your credit card details to qualify. Head into the Rio Bingo lobby and you will find plenty of tabs to choose from including Free Bingo, 90 Ball Bingo, 75 Ball Bingo, Lavish Jackpots and the VIP Club to name but a few. Click on any of these and you will be presented with a list of rooms, the majority of which are only available to funded players. There are loads of rooms to choose from but you are given all of the important information you need to consider before deciding where you want to play. 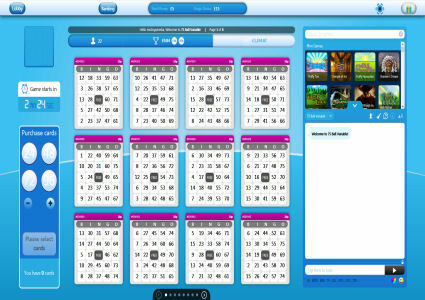 The actual rooms themselves use the software’s standard layout but do maintain Rio Bingo’s blue and yellow colour scheme. It’s a bit of a shame they have not made more of an effort but everything is laid out nicely and works well. The left hand side of the screen is dedicated to your cards and on the right you have a chat room that doubled up as your first port of call if you need support. 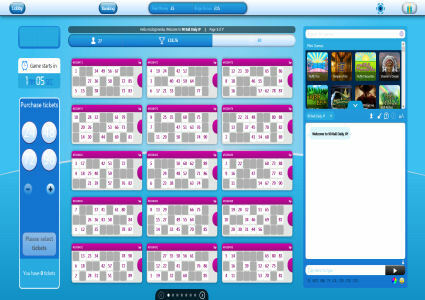 At the top of the screen you have a wide range of slots, instant games, scratch card and table games, all of which you can enjoy whilst playing bingo, but they do reduce the size of the chat room. 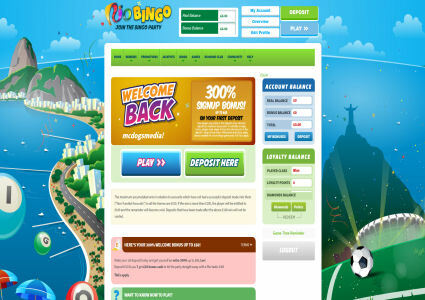 For such a new site, Rio Bingo certainly is well put together. They have plenty to offer both and old and new players alike, and with their free no deposit bonus, you have absolutely nothing to lose by signing up and giving them a try. With the backing of Mandalay Media they are sure to do great things in the future and we expect to see many more promotions added to the line-up over the coming weeks. We’ll be keeping a close eye on his new brand and updating this review as and when the site becomes more established. Rio Bingo is powered by the popular 888/Globalcom software and therefore home to 75 ball bingo, 90 ball bingo and a large range of slots and instant games. The software is one of the best around and has been honed to perfection over the years to make sure everything works just perfectly. There are plenty of options built in, including the ability to change the shape and colour of your dauber to make things a bit more interesting. There is a handy auto buy facility allowing you to purchase cards automatically if you have to step away from the computer for any reason. In the chat room there are plenty of emoticons and all of the usual acronyms such as GL, WTG, 3TG, 2TG and 1TG, all of which save you having to keep on typing them over and over again. You can also change the size and colour of your font to make you stand out from the crowd. One of the nicest features though, is the ability to purchase virtual gifts with your Loyalty Points, that you can then send to anyone else in the room. Rio Bingo may be a new site but this does not mean they are scrimping on jackpots. Every day between 9am and midnight they host a beach party and give away a whopping £1,200. There are two rooms to choose from; 5p Beach Party and 10p Beach Party, each with its own guaranteed cash jackpots! From 9am until 11pm, there are 75 ball bingo games, each one complete with a £50 prize. The 10p Beach party games take place every two hours between 10am and midnight with a £100 prize pot; £50 for the full house, £30 for two lines and £20 for one line. From the moment you register at Rio Bingo, you automatically become part of their Loyalty Scheme. For every £1 you add to your account you will receive 1,000 Rio Points. In addition to this though, you can pick up an extra 10,000 Rio Points for each friend that you refer that signs up and then goes on to fund their account. You can redeem your points at any time and you will receive £1 in bonus funds for every 1,000 you redeem. As Rio Bingo had only been open a week at the time of writing this review, we can forgive them for not having a vast array or promotions. Nevertheless, the promotions that they do have running are certainly impressive. In addition to this, Rio Bingo are hosting Samba Surprise games every hour from 9:15am until 5:15pm, and then every half hour right up until 11:45pm. You won’t find out the price of the cards or the prize you are playing for until the previous game has finished though. There will be all sorts of samba-tastic goodies up for grabs, including real cash, bonus cash, Rio Points and even tangible prizes!